What is a Layer-3 Switch? The layer-3 switch works just like a router. It appears to be like the layer-2 switch but without the WAN interface. A layer 3 switch merges the job of a switch and a router. It acts as a layer-2 switch to link the network devices which are on the same subnet or VLAN at high speed and has IP routing intelligence built into it as it functions as a router. It can perform the same function as inspect incoming packets, routing protocols, and can also do routing decisions based on the source and destination addresses. By this, a layer 3 switch acts as both a switch and a router. 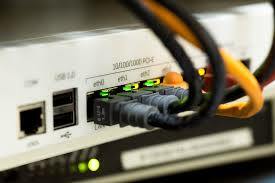 Generally, router use software for the IP routing function. But layer-3 switches use a dedicated hardware chip (ASIC) which provides high-speed packet switching. ASIC stands for Application-specific Integrated Circuit, it is a chip customized for a specific purpose. The method of route catching, pattern matching and path determination is similar in both the routers and in the layer-3 switches. Both use a routing protocol and routing table to determine the best path. However layer-3 device supports reprogram of the hardware dynamically with the current layer-3 routing information. This allows layer 3 switches for faster packet processing. But reprogramming is not supported in routers. The routing feature in Cisco switches is enabled by executing an IP routing command in the Layer-3 switches. In an organization where large networks are managed with layer-3 switches, the routing featured is used to route VLANs or different subnets with a fast switching process. Layer 2 switch operates on the layer 2 of i.e. data link layer of OSI model whereas layer 3 is a multilayer switch which operates in both layer 2 and layer 3 i.e. data link and network layer of OSI model. Layer 2 is a LAN device which can perform switching on the basis mac addresses of the network device while Layer 3 switch is a device which can perform both routings and switching on the basis of IP address and MAC address respectively. It is faster as compare layer 2 switches and routers. Layer 3 switches are appropriate only for large intranet environments like large private Corporation and Government offices with a lot of device subnets and traffic. Homes and small organizations don’t require these switches. The reason behind it is costlier as compared to the layer 2 switch and router. A layer-3 switch can perform layer-2 tasks such as VLANs and IP routing. The idea of creating a layer-3 switch is to enable the inter-VLAN routing or the internal routing perform efficiently between multiple broadcast domain (multiple LAN where each LAN has its own subnet) while keeping the layer-2 features such as spanning and trunking, intact. Previous Why Router On Stick Had Been So Popular Till Now? Next 3 Modes of VLAN Trunking Protocol(VTP), You should Know About it.